For those who grew up reading comics, I&apos;m sure you will agree with me when I say that it&apos;s every child&apos;s dream to one day meet their favorite superhero. Superman, Thor, Wonder Woman, Fantastic Four, Batman...well, my favorite all time superhero is actually a comic book creator named Dwayne McDuffie. In the realm of comic books, Dwayne is Jackie Robinson to me. Mr. McDuffie paved the way for artist like me to follow; and if followed correctly it will guide an artist down a successful path. Percy Carey: Where were you born, and when did you realize you wanted to work in comics? Dwayne McDuffie: I was born in Detroit. I never really saw myself working in comics, I just fell into it. But it&apos;s been one of the best things to happen to a kid from Detroit. Percy Carey: What are some of the titles you&apos;ve worked on? Dwayne McDuffie: Throughout the years I&apos;ve been fortunate to work on a wide range of projects. I was a part of creating a series in the late &apos;80s called Damage Control. I&apos;ve worked on Back to the Future, Monster in my Pocket, Real Ultraman, Fantastic Four, and currently I&apos;m working on the Justice League. Percy Carey: What would you say is your favorite comic book character? Dwayne McDuffie: That is close, between the Thing from Fantastic Four and Little Lulu. Dwayne McDuffie: Greatest comic book ever. People think I&apos;m playing when I say that but I&apos;m totally serious. Percy Carey: Can you tell us a little about Static Shock? Dwayne McDuffie: That project was a team effort with my partners at Milestone, a creative and collaborative an effort. As we read and created comics, one of the problems we found with minority characters&apos;those of color or women or any other such group&apos;was that they&apos;re not just themselves but in fact they represent everyone in that group. So, Wonder Woman came to represent all women, Luke Cage was a symbol of all black men, and so on. In 1993, we were able to come up with 5 character types that hadn&apos;t been seen before in the black community. In Static&apos;s case, when I was a kid I read Spiderman, who was a geek on the surface, but underneath was cool and charismatic. Spiderman allowed Peter to be everything he wanted to be. Now, through the progression of the world and through storytelling, Peter has begun to absorb the traits of Spiderman that he admired, and has moved away from that geeky kid with a cool alter ego. Because of that, I wanted to do a contemporary version of that duality, while at the same time giving the minority community, especially the African-American community, a new hero to identify with. The goal of comics has always been to give readers, to give children, someone to look up to, something to strive for, and the hope with Static was to bring that back. Percy Carey: Speaking for the people, when are we seeing a Static Shock movie? Dwayne McDuffie: Personally, I&apos;d love to see Static Shock back on TV, even better in movies, comic book films are really revitalizing the industry. The rights are out there, so if anybody is interested, I welcome the challenge and hope for a revolutionary take on the story. Percy Carey: On behalf of Complex readers, when it comes to Bronze Tiger and Vixen, will we get to see more? Dwayne McDuffie: Bronze Tiger and Vixen have deep and complicated relationship and it&apos;s not completely over, so we&apos;ll see them get together whenever Tiger available. He&apos;s involved with several storylines, so whenever Tiger can be freed up, we&apos;ll be able to further the Tiger and Vixen story. Dwayne McDuffie: That would be fun, I know I would definitely enjoy that. Percy Carey: What can you tell us about Ben 10? Dwayne McDuffie: Currently I&apos;m working on Ben 10 Alien Force, which is the sequel storyline. In this show, Ben is 15 and has more control over the Omnitrix and its power, but this time around there are more dangers to Ben and to the world. Up until now the shows haven&apos;t seen a major alien invasion. However, starting in season 2, we will start the full out invasion from here on. Things are definitely going to get interesting. Percy Carey: Are there any new projects on the horizon? Dwayne McDuffie: Right now we&apos;re working on Milestone Forever, which will conclude the old Milestone continuity. It&apos;s going to be the last story for that line, and will reveal how that universe connects to DC. Our hope is that new people will enjoy seeing how this world arc joins in, and old fans will appreciate the conclusion and final tie in. Percy Carey: Can you offer any words of wisdom? Dwayne McDuffie: I&apos;ve always felt that the cool thing about being a writer is that all you need is paper to do the job. The best thing to further what you do is write and read all you can. Read both stuff you like to see why its good and read bad to see how to fix. Doing that will help you see and solve problems in your own writing. But I think the biggest advice I can offer is don&apos;t just pick one story and stop, write as much as you can, as many stories as you can. The best thing about being a write is, a writer&apos;s craft is nearly perfect because a writer can go anywhere and do his craft. 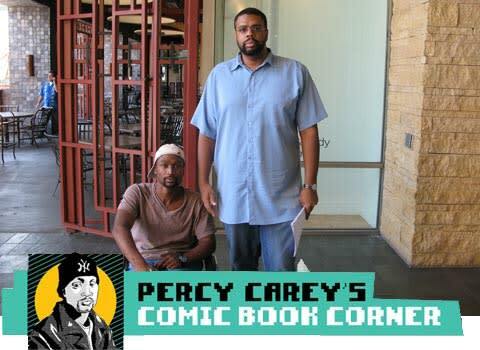 Percy Carey: What do you see as the future of comics? Dwayne McDuffie: I can&apos;t see the future, but I could make some stuff up. But, as someone working in the industry, my theory is people will continue to be interested in comics for film and television. People will try to figure out ways to use comics to tell stories. People used to want to write Spiderman, and now they want to find a way to tell their own stories. I think that is the most innovative way to use comics, because there are so many stories out there to tell. Percy Carey: Who would win in a fight, The Avengers or the New Gods? Dwayne McDuffie: You know, I know I write comics, but I really don&apos;t follow who would beat who. I don&apos;t like many dream fights like that, because no one asks about my favorite team in a fight, the Carebears. Percy Carey: Okay, so who would win a fight between the Carebears and the New Gods? Dwayne McDuffie: Definitely the Carebears. They would win every fight. The New Gods, with all their powers, just aren&apos;t in the same class. At first, they might be scary but 10 minutes later, the Bears would have Darkseid apologizing and buying people lemonade, helping others. That Carebear Stare is seriously powerful. Percy would like to send a special thank you to Mr. Paul Levitz, Mr. Richard Bruning and Austin Trunick over at DC Comics. CLICK NEXT TO SEE PERCY&apos;S COMIC BOOK PICKS OF THE WEEK. The hottest releases from the week of 10/8/08, chosen by Percy Carey. If you&apos;ve heard the buzz about Simon Dark&apos;Gotham City&apos;s strange guardian&apos;but never gave the series a try, then grab this special stand-alone issue spotlighting Simon&apos;s exploration of the dark city in which he dwells. In a Secret Saturdays adventure, Zak and Fiskerton wish they weren&apos;t stuck with a boring babysitter and get way more than they expected! Plus, Aku tries to destroy Samurai Jack&apos;s reputation. From the red dust planes of Mars to the hopping party grounds of Midwest trailer parks, this arc will take the YOUNG LIARS in a direction you never saw coming! The only thing standing between us and complete brain takeover is a lonely little alien girl obsessed with the nighttime radio programming of glam rocker Danny Duoshade. Following the destruction of the first Death Star, Luke Skywalker is the new, unexpected hero of the Rebellion. But the galaxy hasn&apos;t been saved yet-Luke and Princess Leia are finding there are many more battles to be fought against the Empire and Darth Vader! This latest Star Wars Omnibus reprints many of the early tales of the rebellion. First, we have Shadow Stalker, Tales from Mos Eisley, and River of Chaos, all of which are long out of print and have never before been collected! Then, Splinter of the Mind&apos;s Eye, a story created by George Lucas and Alan Dean Foster before there were plans for any films past Star Wars: A New Hope. And last is Vader&apos;s Quest, in which Vader learns the secret kept from him by Yoda and Obi-Wan: that he has a son!